BA, BBA (Ewha Womans University), MBA (Seoul National University), PhD (University of Toronto). 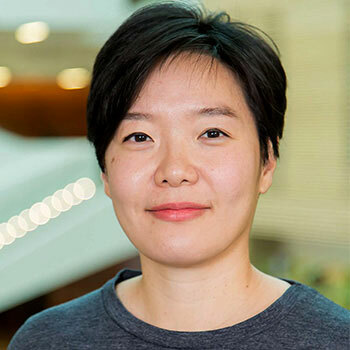 Hae Joo Kim is an associate professor of marketing at Wilfrid Laurier University. She is interested in how subtle environmental cues can nonconsciously affect consumer judgment and behaviour. Using experimental methods, she examines whether features of a product, store environment or advertisement can affect consumer decision-making through the operation of nonconscious goals, low-level affect or processing fluency. Her research offers insight into building effective advertising, market research and branding strategies. Kim’s research has been published in journals such as Psychological Science and has been presented at academic conferences including the Association for Consumer Research, the Society for Consumer Psychology, the Society for Personality and Social Psychology, and the Administrative Sciences Association of Canada. Prior to coming to Canada, Kim worked as a research analyst at Samsung Economics Research Institute in South Korea. Her teaching interests include Introduction to Marketing Management, Consumer Behaviour, Marketing Communications and Marketing Research. Consumer Behaviour, Consumer Goals and Motivation, Nonconscious Processes, Social Marketing. I regularly seek undergraduate and graduate research assistants who are interested in conducting experiments for consumer behaviour research. Please contact me for opportunities. Kim, H. and M. A. Dempsey (2019), “Processing Difficulty Increases Perceived Competence of Brand Acronyms,” Canadian Journal of Administrative Sciences, 36 (1), 47-56. Gill, T., Kim, H., and C. Ranaweera (2017), “Ethnic Stereotyping in Service Provision: When do Stereotypes affect the Performance Expectations and Evaluation of Ethnic Service Providers?” Journal of Service Theory and Practice, 27 (3), 520-546 (equal contribution). Ahn, H., Kim, H., and P. Aggarwal (2014), “Helping Fellow Beings: Anthropomorphized Social Causes and the Role of Anticipatory Guilt,” Psychological Science, 25 (1), 224-229 (equal contribution).